A small space shouldn’t stop you from carving out your cozy corner! Tip: Looking for a quirky twist? Have fun with your shelves! You can also work with unexpected styles and designs. Click here for ideas. A small space shouldn’t stop you from carving out your cozy nook. To recreate the look above, set up a chair in your chosen corner and spruce it up with a fluffy throw pillow. Add a slim floor lamp and you're all set. Worried about your reads? Stack thick magazines to create a makeshift table. Keep it sturdy by tying it with a string. You can do the same with your favorite hardbound reads. 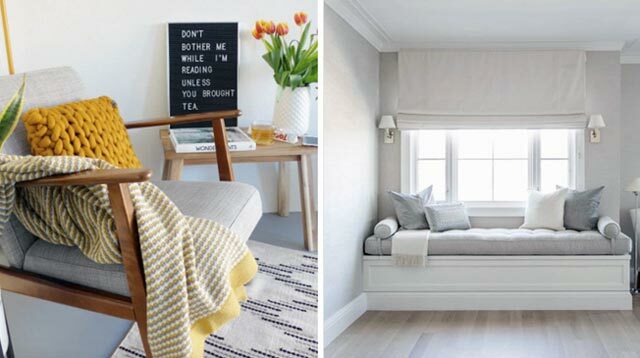 Looking for ways on how to update an existing reading nook? Be creative with wall art! Opt for pieces showcasing bright hues, choose pillow covers with patterns, and display a vase of flowers. You can also take your cue from the photo above by using hints of gold as an accent. Whether you have tiny knickknacks or a side table in gold, these must-haves will no doubt shine.